If you are wondering how you can upgrade your Honda accord audio system, I’m here to help you. You can find many aftermarket car stereos at fairly reasonable prices that would make your driving experience more pleasurable. But the big question is : How to remove my old radio and install a new one? You can give it to a professional, but believe me, you will have fun doing it yourself. Are you ready? Let’s go!! The first step in installing new Honda car stereo is gathering the needed tools. You can refer to the instructions that came with the new radio to have an idea about what tools you will be using during the stereo removal and installation process (Screwdrivers, pliers, wire strippers…). Next, disconnect the car battery. Just isolate the negative black cable and leave the red one connected. This step will protect you and your car electronics. Keep reading, you will find a detailed step by step guide on Honda accord radio replacement. To remove the radio, the center dash panel must be removed first. In total, there are three screws securing this dash panel to the main dash assembly. One of them is hidden behind the clock. You will need a small flat head screwdriver, insert it between the dash panel and the edge of the clock assembly. Softly, squeeze out that edge of the clock. Use your fingers to remove the clock from the dash panel completely. Unplug the plastic connector once you pull out the clock. Note the single screw after removing clock assembly, remove it. Now all the screws have been removed. Pull on the corners and the bottom curve of the dash panel. Continue until all sides of the plastic dash have entirely pulled away from the main assembly. After pulling out the plastic dash panel from the main dash, turn it so that you can see and unplug all the wiring at the rear side. The stereo unit is secured by four 8 mm bolt screws or four Phillips screws. Remove theme all, pull the radio out of the dash and unplug the antenna cable and the wire harness connector from the back of your radio. All information needed to successfully mount a new stereo unit is included on this tutorial. If you need additional help, please contact me or post comments below. This vehicle requires an installation kit specifically designed for Honda vehicles. Position the installation kit into the opening in the dash. Use the original screws that had secured your old Honda radio to secure the installation kit. It must be well aligned, you can test fit the mounting of the kit before permanently mounting the radio. In our case, The kit used here require that the radio be mounted to the kit prior to reattaching the plastic panel surrounding the radio. Once you secure the kit to the dash assembly, you can mount the radio. Just plug in all wire harness connectors into the rear of your Honda stereo and do not forget to plug the black antenna cable. Plug the air conditioner wires and then reattach the plastic panel surrounding the radio. Secure it with the screws removed earlier. The final step is to snap the clock back in place. Congratulations, the installation is now complete. As you see, removing and installing a new Honda accord car radio is not that difficult. For more help take a look at the video tutorial below. If you encounter any problem please feel free to contact me or leave your comments below. Have a nice day. I purchased a replacement radio from a salvage yard. I entered in the new radio serial code and the VIN# for my vehicle but it tells me that they don't match up. I also tried entering in the VIN# from the vehicle that the radio came out of, but that isn't working either. What can I do? There is a nice YouTube video with step by step intructions. Or you can go to the dealer and fork out $150 clams. Hi, need help with 2008 Honda CRV radio code in Canada. It flashes "ERROR CODE E"
can you send me please the radio code? How to reset Honda CR-V Stereo Code | Anyone Can Do It! Almost all Honda radios have their anti-theft system that, if the battery is disconnected, will ask the owner or user to enter a five digit code so that the stereo or Cd player will work again. 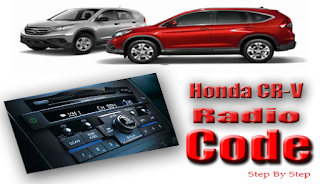 When you purchase a car, the dealer of the company should give you the Honda CRV Radio Code. It may be written in front of your user’s manual. But if you lost your stereo code, you need to contact the dealer of the car who sold it to you and ask them to look the auto-radio code for you. If the power of the battery to the radio was lost altogether, all the presets of your station will be deleted. So you have to find your preferred stations in the audio system and reprogram it again. A Step By Step Guide To Unlock Your Honda Accord Stereo Major car producers like Honda introduced an enhanced security feature, the Honda accord stereo code to protect the car radio from theft. It was initially a great feature but with time the big issues of inconvenience started to become a common customer complaint. Although, the change has protected the radios, but it is now causing a lot of issues for the owners themselves. Over the time, customers all around the world began complaining about the Honda security system and finally there was a solution to the issue, the Honda accord code calculator. This software enables the users to generate their codes and unlock the radio very easily if they follow a step by step stereo unlocking guide. How to Get Honda Stereo Code for free | Fast and Easy Steps! The Honda car radio code is part of security features for your car audio system, and if your radio is flashing the word CODE, you will have to put in the unique code to use it again. Honda car radios are equipped with an anti-theft system, which basically renders the radio inoperable when a thief removes the radio from the vehicle. The radio theoretically becomes worthless as soon as it is disconnected from the Honda car. Why And When The Honda Radio Will Ask For Code The radio will ask for a Honda stereo code when it is removed from the car as well as when the car battery is disconnected accidentally or when performing a maintenance procedure. In simple word, if your Honda car radio loses power you will need to use a radio code to unlock it. >>> Helpful TIP :How To Change Your Car Battery Without Losing Your Radio Code.